You were born for a purpose. You were born to make a difference. You were born phenomenal. You aren’t an average. Everything you do is an average not because it’s average but because you made a decision, you made a choice to be an average. Why? Because people around you are average or maybe you grew up in an average environment. So, you you decided to go against who you are. You aren’t living like you should live. You are not being who you should be. You have never committed yourself to something. You have never seen what you could be if you threw your whole self at your dream. If you quit however, it will last forever. You have to believe that something different can happen. He who says he can and he who says he can’t are both usually right. Most of people say they want to be successful but they don’t want it bad they just liked the idea. They don’t want it bad as much they want to party. They don’t want it as much they wanna sleep.Go deep in yourself and ask yourself who you are gonna be and how you gonna do it. Just decide. It’s time for you to look within yourself and decide that I am in charge of my destiny. And when you decide that you are going to do it, life will never be the same again. One day it’ll be your day. One day you gonna own a moment of glory, a moment of success. Work on yourself and live your dream. 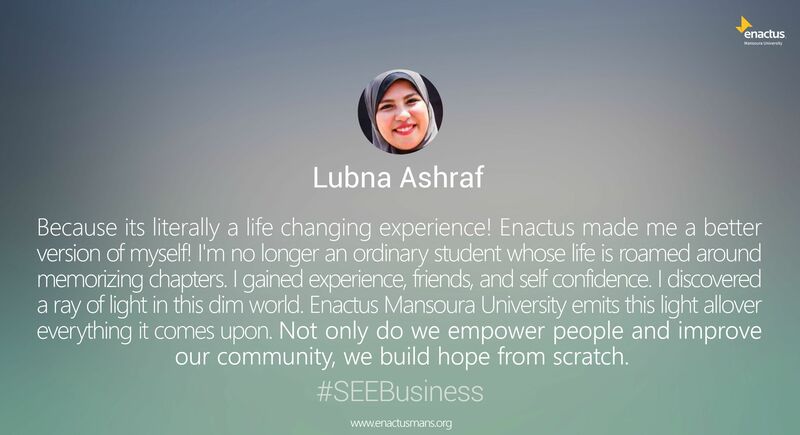 Enactus mansoura has raised the hashtag #SEEBusiness for its recruitment campaign. At the early beginning you may guess that, that “SEE” means watch or find business. But in fact it doesn’t! This is also known as Human Capital. It really just means treating your employees right, and extending that into the community where your business operates. In this part of the triple bottom line model, business not only ensures a fair day’s work for a fair day’s pay; but also reinvesting back some of its gains into the surrounding community through sponsorship, donations or projects that go towards the common good. The Economic element in the triple bottom line is about making an honest profit rather than making a profit at any cost – profit must be attained in harmony with the other two principles of People and Planet. However, it is equally true that without people and the environment, companies would not be able to operate. This relationship between profits, people and the environment is what informs the triple bottom line concept. In the past, many major corporations and policy makers frowned on the idea of having companies be accountable to people other than their shareholders. However, a greater awareness about the environment and how people in and outside an organization work together to the benefit of each other has brought to the shore the importance of the triple bottom line concept. Today, many organizations have significant community and social responsibility budgets geared toward giving back to the communities in which they operate. The Triple Bottom Line concept has changed the way businesses, nonprofits and governments measure sustainability and the performance of projects or policies. Beyond the foundation of measuring sustainability on three fronts; people, planet and profits. The flexibility of the TBL allows organizations to apply the concept in a manner suitable to their specific needs. 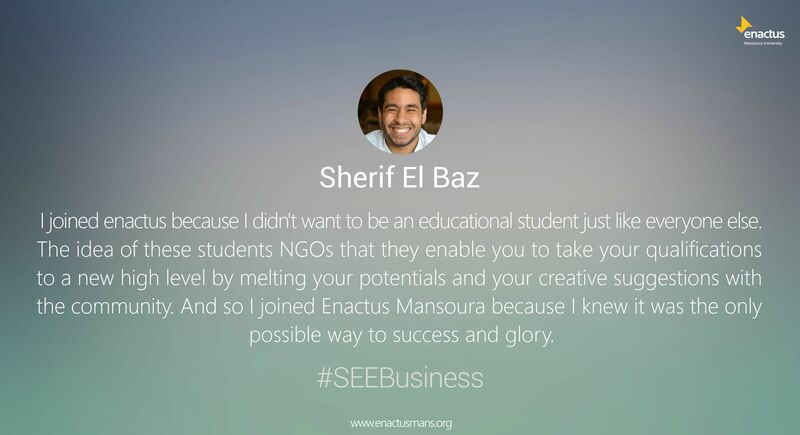 Enactus Mansoura, a part of my life. Abdelaziz Boghdady, the EX chairman of the board of Enactus Mansoura. He was asked: “If you weren’t an enactus member, why would you join enactus?” and his answer was..
My motivation for applying to this organization is because of the unmatched value enactus places upon its people and the excellent self development opportunities enactus provides. I believed that the only race I have to win is the race against myself, there will always be someone faster and stronger but there will never ever be another me, that’s why I urge anyone who want to be a part of this entity to push their own personal boundaries. Have the strength, the courage, and the confidence to pursue their dreams. In every situation there is always something to be learned, and if we are able to take away the important lessons, we will eventually achieve what we set out to do. A further step in my enactus career aspirations was becoming a part of its management. I believed that I have the drive, determination, and energy to succeed. I was willing to commit to the time and dedication needed to complete the mission. I believed that being a part of enactus MU’s administration requires solid understanding of how to manage and lead, especially in the times of stress and conflicts, along with a deep perception of enactus’s concepts, and work model. 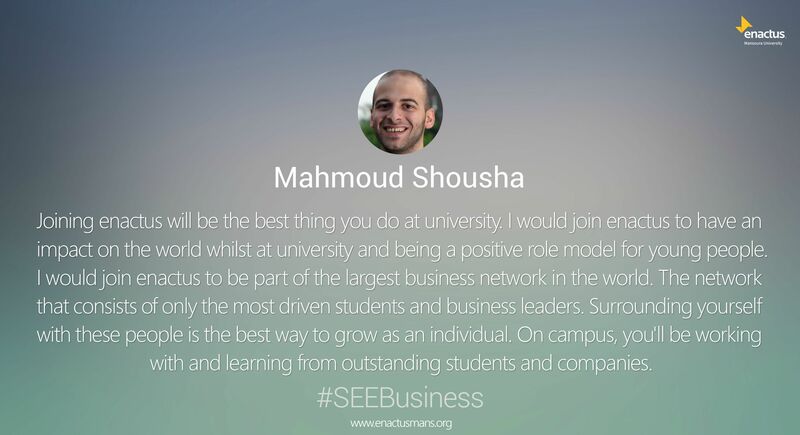 And that’s exactly what I have been striving to achieve over four years of working within enactus Mansour University. 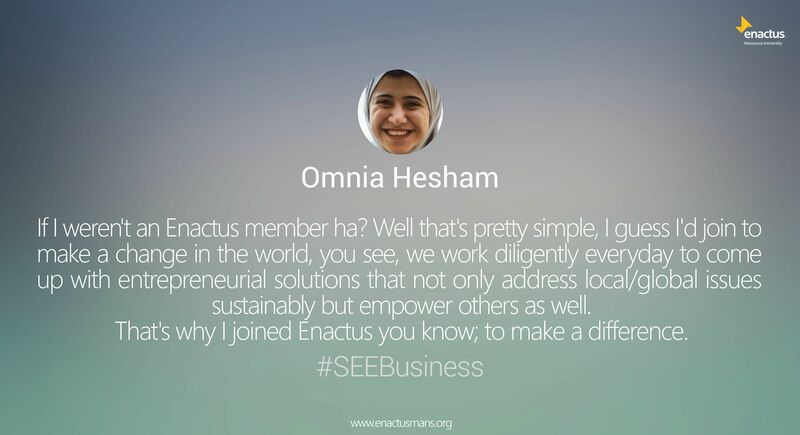 In enactus, I found a real unique combination of high quality trainings and experience in international business..
Omnia Hesham, the vice president. Lubna Ashraf, the human resources director. 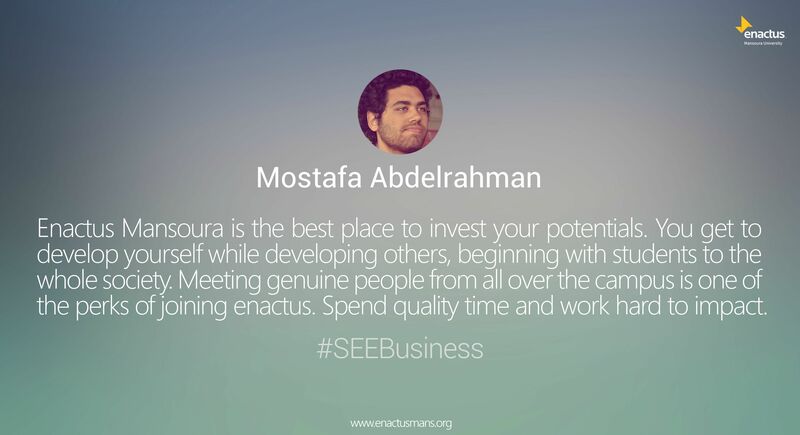 Mostafa Abdulrahman, last year’s presentation affairs officer and one of the people who built enactus Mansoura University. Shrouq tareq, a 2011 mini dollars graduate and the current mini dollars project manager. 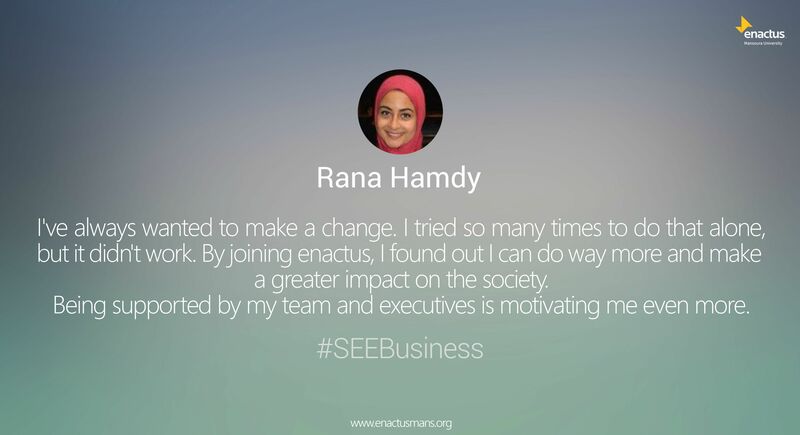 Rana Hamdy, the marketing officer. Yomna saraya, ex project manager assistant. Amr saher, general secretary of enactus mansoura. Have you ever thought that you keep wasting your time spending hours and hours on the social media? Why don’t you devote your free time in something useful? How we spend our days is, of course, how we spend our lives. Time is arguably our most valuable commodity. Now you have a chance to gain experience but you can’t create experience. You must undergo it. As the only source of knowledge is experience. Joining enactus will allow you to go through business experience and Broadening understanding. You’ll not wake up again feeling like you are passing another day like the one before. You’ll have something to do. You can make a change. Another thing you have to take in consideration, Society needs you. Your society needs your help! When you join enactus, You’ll no more feel useless about yourself. You will give a hand to your society and a hand to yourself to be an effevtice person who has a role in his life. You’ll be able to deal with people from different classes, know what they need and how you can help. Your work won’t go in vain as a plant that grow within seasons but eventually it will give you fruit. Just be patient! Now, If you are waiting for a sign THIS IS IT. This is your moment to make a change. This is your moment to take an action. Action is the fundamental key to all success. Get ready to join Enactus, the largest entity on campus. You cannot put the word “Enactus” on your google translator to find out what it really means.”Enactus” did not come out of nowhere. •us—a group of people who see themselves connected in some important way; individuals that are part of a greater whole. Still didn’t answer the question. 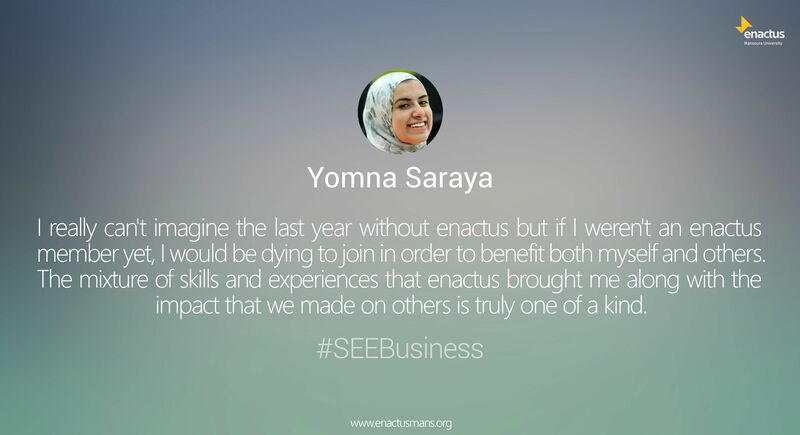 Why Enactus? Joining Enactus will drive you to a win-win situation where the “loss” expression will not be heard. As in a two-person scenario, where both people could cooperate and thus benefit, this could be mathematically expressed and +1 plus +1 = 2. Instead of a situation creating a winner and a loser, both people win a roughly equivalent amount. Joining enactus will enhance your business skills and give you a forward push into the business world. So you got to know more about business skills that you’ll gain. 1)Communication skills: Constructing an argument and making your case forcefully to your boss and client will move your ideas to fruition. 2)Time management organization: Staying organized and prioritizing tasks will go along way to moving you and your team forward. 3)Goal setting: No business operation will go anywhere without a vision that forces and solidifies all activities teams are under taking. 4)Delegating: Surrounding yourself with talented people who can augment your skills and get things done every time without fail. 5)Presentation skills: Communicating using the internet can be easy and saves your time but face to face encounters will give better results. Your way of speech and facial expressions play an effective role reaching your point. 6)Relationship building: Nothing helps lay the ground work for advancement more than cultivating good relationships. 7)Passion and determination: Motivation has to come from within the drive to excellence is entirely an internal affairs. 8)Entrepreneurial and innovation skills: Taking a sense of imagination to conceive new ways to create value. New ideas aren’t generated by machines but they come from minds of people using machines. 9)Flexibilty and adapabilty: Be open to new ideas, environments and responsibilities. Technology will constantly be changing so professionals need to change as well. becoming too overwhelmed or stressed. By joining enactus you’ll be able to cooperate and live the team work spirit. Teamwork involves different people and different groups across your business working together to maximize their efficiency and reach a common goal. In addition to providing team members with experience, benefits of teamwork include increased efficiency, financial savings, innovation and morale.